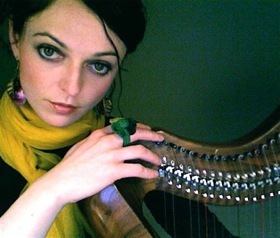 Musician Catriona McKay is an internationally renowned master of the Clarsach (Scottish harp). Working with her musical partner, leading electro-acoustic composer Alistair MacDonald, Catriona explores the boundaries of her traditional instrument through experimental music and improvisation. Catriona McKay & Alistair MacDonald's music incorporates the acoustic sound of the harp, the use of recorded environmental sound and transformation of these sounds to create hybrid musical textures in composed and improvised performance. In the past their work has been performed and recorded in a variety of concert venues and recording studios. In their project A See of Green they intend to take performance back into the environments where some of the source sound materials for the work were recorded. A See of Green, relates to political developments in relation to biodiversity in the forestry industry and the impact this will have on recreational users of woodland areas in the Huntly Area. A See of Green expands the generally accepted boundaries of the harp (clarsach) contextualized by outdoor, site specific performance & recording of mixed live and electroacoustic music. Catriona Mackay and Alistair MacDonald will sample the aural environment of the woodlands and forests around our town, soundscapes will create the backbone of See of Green, creating public awareness of this often overlooked aural aspect of the environment. The performance will take place in the woods themselves. The approach will use the soundscape of the Huntly area as both a source of inspiration and a sound palette creating new work which connects the listener to their environment. This will provide the community with a catalyst to consider access issues and their relationship with these special places around the town. Catriona McKay & Alistair MacDonald's music incorporates the acoustic sound of the harp, the use of recorded environmental sound and transformation of these sounds to create hybrid musical textures in composed and improvised performance. In the past their work has been performed and recorded in a variety of concert venues and recording studios. In this project they intend to take performance back into the environments where some of the source sound materials for the work were recorded. In performance, the environmental sounds present at the time of performance will become part of the work along with transformed sounds recorded in the same place but at different times, and the harp will be heard in the context of these sounds transformed not only by the laptop, but also by the natural acoustic of the woods. The duo will work in a number of spaces reflecting not only the different acoustics of the forests (deep forest, marginal town forest etc.) but also the use and purpose of the places themselves (commercial, leisure, bio-diverse plantations&ellipsis;). For this project, novel, active recording techniques will be used - the recording will not simply be a document of the performances, but will be, itself, an actively 'composed' piece made in collaboration with composer Robert Dow. On the 2nd of November 2008 Catriona and Alistair gave a performance in the Christ Church, Huntly, which was the first fruit of Catriona's residency at Deveron Arts. Strange Rainbow incorporated sounds drawn from the people, landscape and history of Huntly. Previous work by the duo includes The Salutation which recalls the herring fishing industry in Shetland in the 1930s and the Ap Huw Dialogues which draws on ancient harp manuscripts.